The intricate details about Sound Design & Music on Dragon Orb! I had the pleasure of working on this Swedish project, and here are some notes about Audio for VR, especially for games where the sound isn't the main thing. Dragon Orb is fast-paced arcade game where you are challenged to smash together Dragon Orbs that appear around you, to release the encapsulated dragons of Reigndar. Are you quick and witty enough to champion the land? Then step into the portal and begin! When Sam Zayas from WaVR Tech in Gothenburg invited me to join the team he already had some ideas regarding music. The most important was that the music shouldn't be frantic or loud. Since the game is somewhat fast-paced and intense, music should be relaxed and in a positive mood. When I came up with a harmonic chaining concept, where each level would have music in a different key, but every time that the next level appears, the music would be more compelling than the previous one. But there was a problem. If music was random (based on levels), sometimes it would happen to have a G-F transition, which makes things a little dull. The solution was to make the third music in G minor, so if it goes to C Major it would be ok and to F Major it would create a certain sense of boldness. There are also tense endings for each one of these songs, as the time expires and you need to finish the level. Short outros with some tension raised using TImpani, Cymbals and other musical elements. All music was made in Ableton Live, binauralized in Reaper and delivered in Dual Mono for better placement around the game arena. 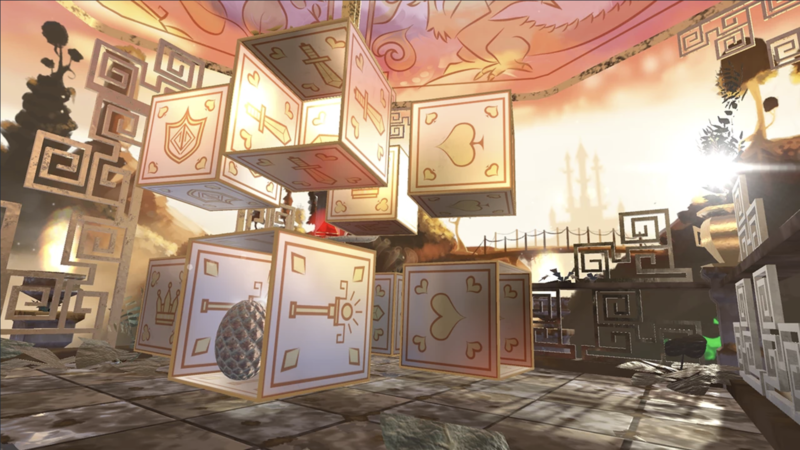 The game was developed in Unity. No audio middleware and using Steam Audio for spatialization. All Sound Effects (SFX) were created in the same way of the music. All of them are in the same harmonic field, and they interrelate, except for the ones that are the representation of real things, such as the torches around the arena. In this case, I created 1 different torch loop for each one of them, to give more sense of spaciousness and make things more interesting. Of course, when SFX are meant to raise awareness or create disruption, I go out of the harmonic field and use different notes and textures. Music here isn't the most important. But Music and Sound Effects should be there to enhance the feelings and help players understand more about what's happening in the game. The harmonic chaining, the details of EQ, finding and mixing the proper sounds, visualizing the materials and colors to try to translate them into music, putting sound effects in the right place, attaching them to the right action or object, all these tiny things regarding Sound Effects and Music make all the difference while playing, even though the player doesn't quite perceive them. But they are there to make the experience even more immersive, so you can really believe that you are entering the realm of the Dragons of Reignard. And soon it will be fully available, with lots of levels (when I mean "lots" I really mean it), puzzles and fun.